Welcome to the Garden of Union! Membership orientation information is below. While we do not enforce work requirements, everyone needs to pitch in. Trash is a constant and everyone can help keep trash picked up. The garbage goes out on Wednesday and Sunday nights. If you see people letting their dogs use the tree pits out front, please ask them not to. When you open the garden, you are responsible for enforcing our rules. The Garden is open to all. When you enter the garden, always lock the lock on the front gate. Change the numbers. This is so the lock is not lost, stolen or damaged. Before we made this rule the lock was dropped in the dirt, put in a pocket and taken home or left in an odd place in the garden. With our new system, everyone knows where to find the lock. Leave the gate open while you are in the garden. This is mandated by our agreement with GreenThumb, the administrative agency of the NYC Department of Parks and Recreation that oversees community gardens. Many of our rules stem from the requirements of this agency. Other rules are to keep us safe and to ensure that the garden is accessible to as many people as possible. Volunteers invest their time and their hearts to make the garden functional and wonderful. Living systems are easily damaged. Please respect both the garden and those who care for it. We garden above ground. While many people still like to dig their beds, many of our members choose no-till cultivation methods. There is some lead in the soil at the perimeter of the garden. This area is used mainly for perennial plants and is stewarded by long standing members. Anyone can propose ideas – keep in mind that long-term structure is an important aspect of the garden. The center has tested low (acceptable) lead levels and receives so much compost that we are mostly gardening in new material. Soil care is important to the success of our garden. We mulch regularly and moving compost from the finishing (wooden) bins is a favor to the garden and the tree pits out front. We do not give compost to individuals, even if they contribute material, because this is Brooklyn and that privilege would quickly be abused. Once in a while we have a small amount of extra compost we may give to another project. Because we are a rubble-site, most of our compost is used in our garden. The Park Slope Food Coop, garden members, and the garden itself all contribute to the compost. It is the garden members’ job to move the compost out of the finishing bins. That work does count toward harvest rights. We are a communally operated space. The beds are shared through a stewardship system. The stewardship committee receives applications in the fall and by winter’s end beds and areas are assigned. The committee is formed by at least 3 members of the board of directors and the board reviews and finalizes their decisions. The perimeter of the garden is largely perennial and is often stewarded by long standing members. 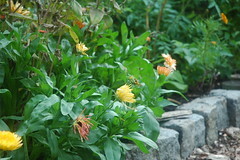 The interior beds are mostly annual and allow new members to get into the garden and plant. Please do not put perennial plants in annual beds. Stewards are usually people who have been present in the garden and those who pledge to be present. Stewardship is a responsibility. Stewards are expected to communicate frequently. They integrate new members, attend meetings, volunteer to help run events and assist in keeping the garden orderly. Stewards are responsible for coordinating the planning, planting, care and harvest of their beds or areas. They also need to undo the beds and put them to rest at the end of the season. Mulch is applied to beds at least twice a year. Stewards’ phone numbers are listed for garden members to call. 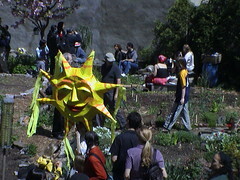 The stewards help members find places to plant and other jobs to do to help the garden function. Planting is actually one of the easiest tasks in the garden year. Seeds are ordered for the group and are in the shed for everyone to use. 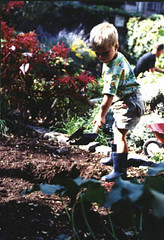 Bedding plants are usually purchased by individuals and are sometimes donated to the garden. Big decisions in the garden are made by a consensus method. If we can’t agree we just wait. This can be frustrating for people who like to just decide and get it done but it has lead to less arguing and hurt feelings in the garden. People tend to attach very strongly to this space. We work to respect everyone’s opinion and we invite diverse ideas and input. No one will agree with every decision and we sometimes let less important details go the way of the person most interested in them. It is a give and take system. We work to give as much as we can to as many people as possible. This happens best through cooperation. are usually held at Ozzie’s on 5th Ave. and begin at 7PM. They sometimes move to the garden or a near-by restaurant so please check with someone to confirm. Check out our calendar for more information. Social activity is part of our garden community. We plan events to help bring members together, get to know each other a bit, share news, and just enjoy the garden. Helping to host these events and keeping the garden open during regular open hours are ways you can earn harvest privileges. Use the garden in ways that do not disturb others and you will be able to enjoy the space freely. Rules change over time – the garden is shaped by its membership. We honor our gardens history and the many people who have devoted themselves to its creation and care. In years past we had quite a bit of rowdy activity just outside our garden gate. Be careful when you are in the garden – don’t leave bags and bikes right up front if you are in the back contemplating the roses. Use common sense. Keep track of children and visitors. Don’t step in the beds. If you plan a social activity, plan to invite everyone. Feel free to hang out and read your paper or just enjoy the flowers! Help the garden however you can. Harvest is earned by helping the garden function, on any level. There is a list of things you can do. Don’t go ahead and do things without asking when you are new to the garden. We share with the elderly or needy, with neighbors, children and visitors – please use good judgment and a sense of fairness. If there are three beets, don’t pick them all unless you grew them. If there is a whole bunch of something, pick some and leave some. If you harvest a big haul of potatoes or edamame, make an effort to share. If you think something is going to waste, ask the steward. They are there to help distribute the harvest fairly. Plant crops we can easily share such as leafy greens, beans, abundant flowers and herbs. Make beds accessible and don’t step on other peoples’ stuff. Cooperation and respect are really important!